Homepage. This page: Yet another in-house BMC (Austin, Morris etc) magazine published in the early 1960s. Worldwide - BMC's in-house dealer magazine. Three odd copies of Worldwide, another BMC-produced motor magazine of the early 1960s, turned up recently. I say "another" as I'm amazed at how many magazines BMC produced at that time, promoting their range of Austins, Morrises, Wolseleys and so on. "Sidelights", the magazine for the BMC Driver's Club, already features in this section of the site, as do several copies of AUSTIN, again from the early 1960s, to name just two other titles. The three copies I have of Worldwide magazine date to April/May 1963, December 1963/January 1964, and August/September 1964, and their covers are shown below. As will become evident, Austins predominate in these publications. The Morris/Nuffield equivalent was titled News Exchange. Each magazine contains brief articles and features regarding new BMC vehicles, and also exciting news updates on dealers and deliveries of new cars around the world. Exports, as outlined in the introduction to the April/May 1963 issue, were going to be a priority for BMC going forward. In 1962, BMC had produced a record number of cars destined for export markets - some 275,000 vehicles - but matching this level in 1963 wouldn't be good enough, according to Chairman & Managing Director G.W. Harriman, if the Corporation was to hold its place in the global automobile market. Worldwide magazine would appear to have been created to help spread the word of BMC and their vehicles around the world. This issue was No.3 in Volume No.2, so quite an early issue. There now follows a brief look at each of the three issues, and some notes on the highlights that appear within their pages. Worldwide magazine - April & May 1963. This issue's cover features an Austin Mini surrounded by milk bottles, with the slogan "The Wonderful Austin Mini - Six Miles on a Pinta Petrol". One lucky milkman had won the Mini thanks to his success in a sales drive, organised by the Milk Marketing Board. A note propped up on the rear window shelf advises that the car had been supplied by Wimbledon Motors. Amongst other things, there is a two-page write-up on an experimental twin-engined, four-wheel drive Mini Moke. Designed for winter conditions, there were evidently possibilities for both military and agricultural use for such a lightweight 4wd machine. It featured 848cc Mini engines at either end, controlled by interconnected throttle and clutch linkages. The vehicle is photographed carrying bales of hay across a snowy field, a small snow plough on the front clearing a path before it. We're also told that this interesting prototype successfully pushed a stranded petrol tanker up a snow-covered hill. There were, at the time, no plans to put the twin-engined Moke into production, and indeed there never was a twin-engined version offered to the public by Austin. The idea didn't die a death altogether though, as several creative designers created their own twin-engined Minis, perhaps the most famous being John Cooper's Twini. The four thousandth Austin to be sold in Holland in 1962 was a Mk2 Austin A40 Farina. Ten diesel Austin (FX4) taxis had been delivered to FonAcab Limited by M.H. Cars of Belfast. A 1924 Austin 7 that was still in use as a temporary staff car with a Maintenance Corps of the Federation of Malaya Forces. An Austin 250hp Gas Turbine, mounted on a trailer, was demonstrated at the annual fire officers' conference in Folkestone. BMC's three-millionth post-war export was a Vanden Plas 3 Litre saloon, donated to the League of Red Cross Societies. Officials of the Royal National Mission to Deep Sea Fishermen received a fleet of new Austin Minis for official use. A customer in Tanganyika paid for the deposit on a new Austin with a sack-load of 12,000 one-shilling coins, which took employees of Austin dealers Gailey & Roberts Ltd several hours to count. Texaco Trinidad Inc. operated twenty Minis on their Forest Reserve oil field. A new range of Austin FHK lorries was introduced, rated at 5- 7- and 8-tons. A diesel-engined Austin A60 Cambridge achieved 58.34mpg average on the 1962 Mobil Economy Run. The driver was Mr George Kendrick. The diesel A60 saved 32 percent of fuel when compared to another expertly-driven A60, this time in 1622cc petrol guise, again on the 1962 event. A £35,000 order for 27 Austin Gipsy 4x4s had been fulfilled, the cars being delivered by sea to the Egyptian Government. The line-up of these modified fire tenders is shown at Salford Docks, prior to shipment. A BMC car dealer in Sydney had erected an 87ft x 11ft sign near the entrance to the city, promoting BMC-warranted used cars. Comedy actor Norman Wisdom was photographed during a visit to Longbridge, selecting a new car. His choice? An Austin Mini Cooper. W.G. Wilkinson Ltd of Dun Laoghair, County Dublin, ran a promotion for Mini cars by mounting two examples high-up above their showroom entrance (shown further up this page). Beer enthusiasts in Northern France were in for a treat in 1963. Two 4-ton Austin KG lorries had been built up as mobile bars, promoting Watney's Red Barrel ale. The interior was finished in a "mock Tudor" style, complete with leaded windows, horse brasses and patterned curtains. Worldwide magazine - December 1963 & January 1964. This slightly later issue features an A110 Westminster on its cover, registration 550 HOJ, with a young lady admiring two cast model horses in the foreground. An A40 Farina, a large pre-war Hillman, and a Mk1 Cortina can just be seen in the background. The details on the Ford seem much less distinct than on the other two cars. Perhaps the wavy glass had something to do with it, or else BMC were lessening the chance of anyone being able to identify a rival firm's product on the cover of a BMC magazine by doctoring the image. Big news for this issue was the introduction of the Vanden Plas 1100, a luxuriously-appointed small car based on BMC's ADO16 design. Externally, a new radiator grille, unique to the VdP, differentiated this model from the sporty MG, and the cheaper, vinyl-trimmed variants for the masses. Interiors were beautifully finished on these nippy little motors, a proper wooden dashboard and hide upholstery greeted the VdP driver, but only after he or she had handed over £894.14s.7d (inc Purchase Tax) for the privilege. Options on this model included a wind-back steel sunroof, and, later, automatic transmission. News of a tour of Britax-owned Mini vans, completing a 135,000 miles tour of Britain that saw them visit 750 towns, advocating the use of safety belts in cars. A BMC Mobile Training Unit (shown above) is seen in South Africa, during a two-week trip whereby presentations, lectures and film shows were given to local motorists. The vehicle was one of several specifically built for BMC, most were used as mobile training classrooms, and a few were built as race car transporters for the Works' Mini Cooper rally cars. A Mr John Risby, of Chorley in Lancashire, is pictured with his new Austin Mini. He won it after entering a competition organised by Fidelity Radio Ltd.
Buy a house, get a free Mini - a building society in Denmark came up with this ruse to help shift new houses, and it seems to have been a success, with a good number of people signing on the dotted line for a home, and receiving their 'free' Mini as a bonus. News of an A55 Countryman with over 40,000 miles on the clock, winning fourth prize in a Concours D'Elegance. 95% of the 7,000 taxi cabs in London were Austins. They averaged 50,000 miles per year. London's largest operator - London General Cab Co. - owned 300 FX4 cabs. They operated a 24x7 repair centre. In September, the RAC took delivery of 100 new Austin Minivans. An Austin Gipsy was reported as completing a gruelling 23,000 mile journey around Europe and Asia, for Australian Television. Despite being fully laden it managed 20 mpg. During a "Mini Fortnight", dealers Mann Egerton shifted 24 new Minis. Two-thirds of their showroom had been given over to the pint-sized motor-car during the period, with every model, including the Moke and the £1,000 Radford, on display. Part of the promotion incorporated a Daz competition, whereby entrants had to guess how many packets could be squeezed into a Mini saloon. Convoys of Minis promoting the event were regularly driven around Norwich. Princess Margaret and husband Lord Snowdon were spotted at the London Motor Show, at one stage admiring the Mini de Ville Austin Cooper on the Radford stand. Six Austin 1100s are photographed newly-delivered to a taxi firm in Denmark. Double-A Associated Hatcheries, of Brockworth in Gloucestershire, are pictured with their fleet of Mini Travellers, used for the transportation of day-old chicks. Vincents of Yeovil supplied new Austin vehicles to field service engineers working for Crypton Equipment Ltd, some of which are captured posed alongside a couple of Austin saloons, plus A35 and A55 service vans. Amongst the dealer news items, The International Sports Car Centre, established by the Donald Healey Motor Co. and using a former cinema building in Warwick, had recently opened its doors to the public. Perhaps of most interest though is a snippet looking at an Austin 7-powered Hydroglider (shown above). In 1933 this intriguing vessel was the only power-driven craft to ever make the trip along the River Severn from Stourport (Worcs) to Shrewsbury (Shrops), and back again. The Hydroglider was built, designed and piloted by a Mr W.F. Davies of Dudley. Did it survive? Worldwide magazine - August & September 1964. By late 1964 the magazine had undergone something of a facelift, its cover slightly more simple in its layout. The cover features a young couple blasting along a beach, enjoying real wind-in-the-hair motoring. Despite this being a British Motor Corporation magazine, the car wasn't one ever offered to domestic buyers. 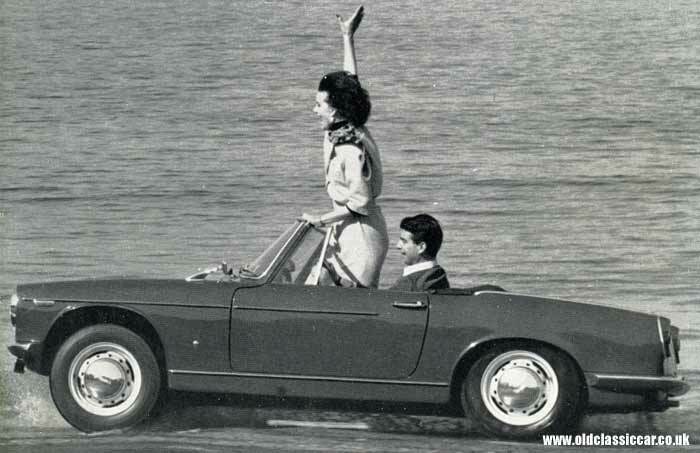 It was in fact the Innocenti Spyder, a vehicle based on the Austin-Healey Sprite, after having undergone something of a transformation thanks to the efforts of Innocenti and Ghia, the firm behind the re-designed coachwork. It was launched in 1961, the 950 Spyder being powered by the same A-series unit as found under the bonnet of the Frogeye Sprite. Wind-up windows, larger doors, and an opening bootlid accessible from the outside were just some of the improvements made to the basic BMC design. A curved screen added to the stylish lines of this attractive sportscar, and, apparently, the Spyder heavily influenced Honda's thinking during the design of their S800 model. The majority of Spyder production remained in Italy, although some did end up in the States and also in Switzerland. News of BMC vehicles in competition received just a brief mention in the earlier two copies of Worldwide I have, but in this '64 issue racing and rally cars take pole position in the list of articles. Minis in the Six Hour Saloon Car Race at Brands Hatch are well covered, as is Paddy Hopkirk and Henry Liddon winning the Austrian Alpine Rally in their Healey 3000 MkIII. Another Healey success came at Playa Ancha in South America, narrowly heading a 300SL Mercedes-Benz for the outright victory. An unlikely rally car perhaps, a 1964 Austin Cambridge, is photographed after finishing first in class in the 1964 Shell Car Rally in The Philippines. Students from Queen's College in London converted a vintage Austin 7 into a mobile Victorian bed, complete with brass knobs, bedding, mattress and pillowcases. The photographer captured the modified Austin driving through Dundee, after a 600 mile drive from London. Fifty Austin J40 pedal cars had now been supplied to road safety classes in Canada and on the Continent. Children in Vienna are shown being taught the ropes by a local police officer. Derek Dooley, a former Sheffield Wednesday football player, recently collected his new A60 Diesel from the Sheffield Motor Co. Ltd. Meanwhile, in Blantyre, a new 3-Litre Princess limousine was handed over to the Mayor of Blantyre at the opening of a new Austin Distributors. Left-hand drive versions of the Moke, and Twini-Moke, were supplied to the US Army Tank Automotive Centre for evaluation. After being challenged to a bet, two members of the "55 Car Club" completed a run from Dundee to John O' Groats, and back again, in under 10 hours, a trip of some 542 miles. They drove a standard Mini Cooper. Various old Austin vans and lorries took part in the inaugural Historic Commercial Vehicle Club run from London to Brighton. Competing vehicles included an Austin HL taxi-cab (1933), a 10hp van (1934), an LL Taxi (1937) and an Austin 7 van (1926). Hearses and mourning vehicles were also in attendance. In March 1964, Westgate Motors (Wakefield) Ltd ran a "Special Mini Display" to help promote their new car sales. 20 Minis were sold during the promotion, which including eye-catching attractions such as a pre-war Austin 750 racing car. A fine display of Austin models was put together at the British Industrial Trade Fair held in Barcelona, with models such as the Austin-Healey 3000, the A60 Cambridge, the Mini and the 1100 in evidence. Children in Germany entered a road safety competition, with one boy and one girl each winning a J40 pedal car for their efforts in designing a safer-motoring poster. Two pages of photographs recall the Austin-Healey Club's trip to Holland, re-uniting British and Dutch enthusiasts of the marque. Various autotests formed part of the group activities. The Portuguese Red Cross is shown collecting the keys to a brand new (RHD) Austin 152 Ambulance. The first Minivan to go into service with the A.A. in Ghana is delivered. Despite these magazines occasionally featuring vehicles other than Austins, it does seem that promotion of Longbridge-built products was the key aim of this in-house magazine. More BMC-produced titles will be added in to the motoring magazines section shortly, including one that focuses on Morris rather than Austin cars.